Can’t bear the heat, but need your fix of coffee? I’m going to teach you how to make the best cold brew coffee – and the magic ratio that makes it all happen. This guide focuses on the cold brew ratio, but in the interest of being thorough, we’ve also collected pretty much everything you need to know about cold brew here, too! If you would like to skip to the ratio, just use the table of contents below to jump! What is the best ratio for cold brew coffee? 1a) How long is too long to steep cold brew? 5) Does cold brew go bad? Caffeine infused people like us need our coffee, but in hot climates, or in the summer, it’s really hard to sip a hot drink while you’re sweating and being roasted alive by the sun. Plus iced coffees are rather bitter, seem hastily brewed, and taste more like the additives and sweeteners than the coffee itself. If only there was a cold coffee that legitimately tasted like coffee, yet also refreshed and rejuvenated! Cold brewing is a brilliant method of extracting flavor from coffee grounds very gradually which results in a milder yet more coffee infused drink. The taste is mellower(which makes it milder) but the caffeine content is actually higher, and whether that is good or bad is completely subjective! The caffeine is indeed released more slowly into your system than with a normal hot coffee, so you’ll feel rejuvenated for a lot longer. Cold brew coffee is rather expensive, at $4 to $5 per glass, so it’s useful to know how to make it at home. The two secrets to brewing it just right are the cold brew coffee ratio and the time you let it brew. I did quite a bit of research into this, checking multiple sources, and it seems that everyone suggests varied ratios! Yet another method calls for 1 part coffee to 6 parts water. Yet another calls for 1 part coffee to 9 parts water. And another, much stronger concoction calls for 1 part coffee to 3 parts water. Other recipes do ask for everything in between, though most of the recipes I saw had an average of about 1 part coffee to 7 or 8 parts water. It’s safe to say that 1:8 is an ideal ratio for a balanced preparation, not too strong, but not too mild, either. A 1:8 cold brew ratio will make you a balanced beverage, but what if you want to make cold brew concentrate you can mix with water, milk, or ice to get the perfect beverage? Simple: Just use a higher coffee to water ratio! Personally, I prefer a 1:5 ratio for concentrate, but some people even go as far as to suggest a 1:1 ratio. While I would not go SO extreme, it is a matter of personal choice and how intense you like your coffee. If you want to experiment with the ratios, make small amounts – just use 30 grams of coffee to 60 ml of water, or 30 grams to 90 ml, and see how intense the beverage is. The other critical aspect of cold brew coffee is the brewing time. To get a little sciencey, hot water brews coffee much faster, because hot water molecules are moving incredibly fast and the molecules of water can interact with the coffee grounds much, much quicker, whereas cold water molecules are relatively slower moving and will take that much longer to interact with the coffee grounds and absorb their flavor, so you need to let it brew for that much longer. That’s also why cold brewing produces a mellower taste, since the acids in the coffee are not released as much in cold water as they are in hot water. So the ratio of coffee you use will also be heavily influenced by the amount of time you let the coffee brew. Most recipes call for brewing at least 12 hours, and some call for even more all the way up to 24 hours. The good thing is that cold brew coffee can last for up to 2 weeks, so you can brew a large quantity of coffee and enjoy it over a few days without worrying about brewing again. In addition, some cold brews(especially the 1:4 ratio ones) are quite strong, and must be diluted with ice or milk before you drink them – of course, if you enjoy super strong and highly caffeinated coffee, you are free to drink it as is! Preparation methods are plenty, involving mason jars, bowls and cheesecloth, or a handy french press. One critical aspect of good cold brew is the coarseness of the grounds you use. You need to have fairly coarse grounds, in fact, the coarsest setting your grinder can produce, otherwise your coffee will be murky and muddy and not as enjoyable as it could be. Simply fill up a mason jar or bowl with water, and according to the ratio you choose to follow, add your grounds and give it a little stir to mix up the grounds well. Cover it up, and leave it outside on the counter or stick it in the fridge. If you are putting it in the fridge, seal it in an airtight container(that’s why mason jars are great) so it does not absorb any other aromas from other items in your fridge. After 12-16 hours, strain the coffee using a cheesecloth(not necessary if using a french press), then a coffee filter(you may still need a filter if you want very clear coffee even if you used a french press), fill it up into a container, and enjoy! It’s super easy to make cold brew with a french press. You already have what you need: good coffee grounds, water, and a french press. Add your coffee grounds to the french press according to the ratio you wish to use. Remember, you can use a mix of ratios from 1:5 all the way to 1:8, depending on how intense you want your coffee. This means if you’re making 1 litre of coffee, you’ll need 200 grams of grounds to use the 1:5 ratio. Add the grounds, and slowly pour room temperature water in. Cover the french press with the lid, and leave it overnight – 12 hours should do the trick. You can leave it in any cool place, or if you wish, even put it in your fridge(if you have a shelf high enough to fit the french press with an extended plunger). Once 12 hours have passed, you plunge and enjoy – but make sure NOT to plunge all the way down, as that will agitate the grounds and cause them to release more bitter substances. Pour into a jug, filtering again if you wish to have a super clear coffee. Dilute with some water or ice cubes and enjoy! Making cold brew with an Aeropress is an interesting experience. Aeropresses are portable and make delicious coffee, so there’s no doubt you can make a good cold brew with it too. The only catch is that the aeropress will be inverted! You’ll place the plunger into the top of the aeropress and then flip it upside down. Place your coffee grounds into the aeropress. If you use 30 grams of coffee, you’ll use 150 ml of water according to the 1:5 ratio, or 240 ml if you’re using the 1:8 ratio(or whatever in between according to your preference). Cover the opening with a filter to prevent anything from getting in, and let it sit for 24 hours at room temperature. Rinse the paper filter and put it in the filter basket, then screw onto the opening. Gently flip it over onto a glass, and extract the grounds into the glass. Filter once again if you wish a cleaner brew, add some water or ice to dilute, and enjoy! Clearly, the advantage of using a aeropress is the ability to be able to make a small amount of coffee for a small fix! Finally, if you’re REALLY committing to the cold brew movement, why not just get yourself a cold brew press? Essentially, it does exactly what you’d do using common household items, but it’s really cool, handy, and the measurements are usually written on the carafe, so you don’t need to use up extra utensils. It’s really easy to make good cold brew using this device. First, fill up the top of the device with as much coffee as you are planning to make – remember the cold brew ratio and keep this in mind when measuring out coffee! Next, attach the raining cap on the grounds container, and pour in the water – again, according to your ratio. The raining cap “showers” water on to the grounds, evenly distributing it all over the grounds, ensuring even flavor extraction. Once you’ve filled up as much water as you need, let it steep for 12-24 hours, like we always do. 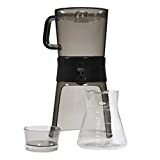 Finally, place the beaker/carafe under the coffee/water mixture, flick the little switch, and watch as your coffee is miraculously filtered and poured into the carafe, ready to drink or store! It depends entirely on how you define stronger. I feel that cold brew has a really intense flavor, though not necessarily very acidic or bitter. I can’t manage to drink undiluted or non-dairy cold brew – though it does indeed taste really nice to me with a splash of milk. Regular coffee, brewed with hot water will be slightly more bitter and acidic, though you may not notice the flavors as much since the beverage will be quite hot. You’ll notice the flavors more in cold brew since you’re drinking a cold beverage and you’re not dealing with the heat on one side and the flavor on the other! Finally, cold brew will release caffeine much slower, so you’ll get a much longer “hit”, so to speak – in that manner, for some people, cold brew may be a more effective boost than regular coffee. The best way to enjoy cold brew is, well, cold! To get your coffee nice and cold you could either refrigerate it overnight as you brew, or you can serve it over ice. Add milk and (if you must) sugar to taste, and you have a lovely beverage to cool off and get your caffeine fix from. What you can also do is freeze some cream or milk into cubes, and use those to cool your coffee to the perfect temperature. This way, you won’t dilute it with water, and the melting milk cube will add cool swirls of white into your coffee as it enriches the flavor and makes it richer. If you find that the brew you ended up with is not strong enough, simply increase the ratio of coffee you use. If you find the brew to be too strong, leave your preparation be, but pour out less and dilute with water until you get it the way you want it. Personally, I find cold brew to be VERY strong. But that’s just me, since I prefer cappuccinos or french press coffees, where the taste is slightly milder. Since cold brew has a lot of coffee left to brew over a long period of time, it ends up being quite flavorful. You could add some sugar or a splash of honey, but in the coffee world, that would be considered blasphemy! Like I mentioned at the start of the post, there is a VAST difference between cold brew and iced coffee. If you were to go and order an iced coffee from your favorite coffee shop, you’d probably get a regularly brewed coffee poured over some ice. This means the coffee was originally brewed hot, let to cool, and poured over ice. Eek! Or it’s a milky coffee poured over ice – either way, I find iced coffees to be rather watery and dull. Cold brew brings out a MUCH richer flavor, because the brewing process is much more gradual and relaxed. One method extracts the flavors really fast, and the other method takes things much slower. Single origin, dark roast, Arabica, and Colombian, Stone Street is a coffee especially made for cold brewing and is a great coffee to start with since you’re guaranteed to get a bold, rich flavor. A mix of light and dark coffee and specifically meant for cold brews, Tiny Footprint produces a silky, sweet, and rich coffee. If you’re environmentally conscious, you’ll be happy to know that Tiny Footprint claims to be the world’s first – and possibly only – carbon negative coffee! Baridi is the Swahili word for “cold”. As the name suggests, the beans in this blend are sourced from East Africa. This blend is not “designed” for cold brew per se, as it actually works really well with iced coffee too, but interestingly enough, a hot brew also tastes delicious. Plus, Peet’s is one of the most reputed and respected roasters around. Since we’re brewing using cold water here, you have to allow enough time for all the water molecules to interact with the coffee grounds and gently extract all the good oils and flavor compounds. If you don’t give it enough time, the coffee simply won’t taste as good, since it won’t have steeped enough. You might as well be drinking brown water instead! Give your cold brew a good 12-24 hours to get the best flavor. Of course, I would not suggest steeping cold brew beyond the recommended 12 to 24 hours. Anything more than that is just pushing it and you’ll begin to spoil the coffee by letting the acids and bitter compounds start to get into the coffee from the grounds. It’s useful to bear in mind that all coffees will behave a little differently from one another and the best way to get the ideal brewing time for your favorite grind and brand is to just experiment from 12 hours to 24 hours and see which taste you like the best. The size of the grind has a great deal to do with how much flavor is extracted. That’s why espressos need a super fine grind to extract the most intense flavor. For cold brew, you need to use the coarsest grind possible. You can’t expect to use cheap or low quality beans and end up with good coffee. Granted, using 200 grams of coffee to make just 1 liter of coffee concentrate does seem like a lot, considering you’d just use closer to 35 grams for 5 x 200 ml cups, but the better quality bean you use, the better flavor you’ll get. To get the best flavor, use a light roast, so it’s not too intense. Light roasts coincidentally have the highest caffeine content, too. There’s no other way around it. You don’t have to use the most expensive beans possible, but there are plenty of good but budget beans available – some of which we’ve listed a bit further down in this post. The ratio for cold brew is super important. Using 1:5 coffee to water or 1:9 coffee to water will greatly influence the strength of your coffee. Depending on if you’d like to make a concentrate or a light beverage, you’ll have to use more or less coffee, respectively. Once your cold brew is ready, its shelf life in your fridge is 10-14 days. If you store it beyond that, the flavor will begin to get funny and taste weird. The solution to not having to store cold brew for too long is to make enough to only last you a week or so. Suppose you make 500 ml of cold brew, and you mix 100 ml of concentrate into 100 ml of water for drinking. This will last you 5 days. At the most, make 1 liter, so it will last you 10 days. Anything beyond that and the cold brew will begin to lose its flavor and turn weird. The ratios I gave above are just in parts, whereas you actually need accurate measurements, so you can just use cups or milliliters. So it would be 1/8 cup(one ounce) for 1 cup of water, perfect for a single drink, and you can keep increasing it proportionately. It is actually a good idea to just brew a large batch at once so you’ll always have some ready to drink. Remember, nothing is set in stone, so you could always adjust the ratio and the brewing time however much you like to get a coffee that tickles your taste buds in a way nothing else can!